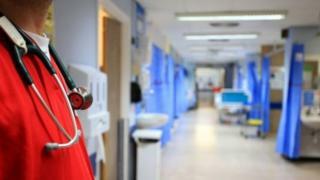 Office staff at two hospitals have been asked to help out on the wards after record numbers of patients were admitted amid winter pressures. The workers from Hull and East Yorkshire Hospitals NHS Trust will volunteer to help on non-nursing tasks. A spokesperson said they could help with taking prescriptions to pharmacies or spending time with patients. Routine operations at Hull Royal Infirmary and Castle Hill Hospital have also been cancelled for eight days. Consultants and nurses – particularly specialists in cardiology, rheumatology and respiratory illnesses – will then be redeployed to work alongside frontline staff in Hull Royal accident and emergency department. The trust said the move would allow patients to receive specialist care without needing to be admitted to a ward. Hospital staff are trying to rearrange operations and some outpatient appointments scheduled up until 6 February. Patients with long-term conditions, those due to have cancer surgery and urgent appointments will not be affected. This is the first time office staff have been asked to help out in this way, and is part of Operation Wintergreen to help ease pressure on services. The trust hopes it will lower bed occupancy at Hull Royal Infirmary and Castle Hill Hospital, in nearby Cottingham, which is currently above 95% and well beyond the 85% recommended for optimum patient safety.